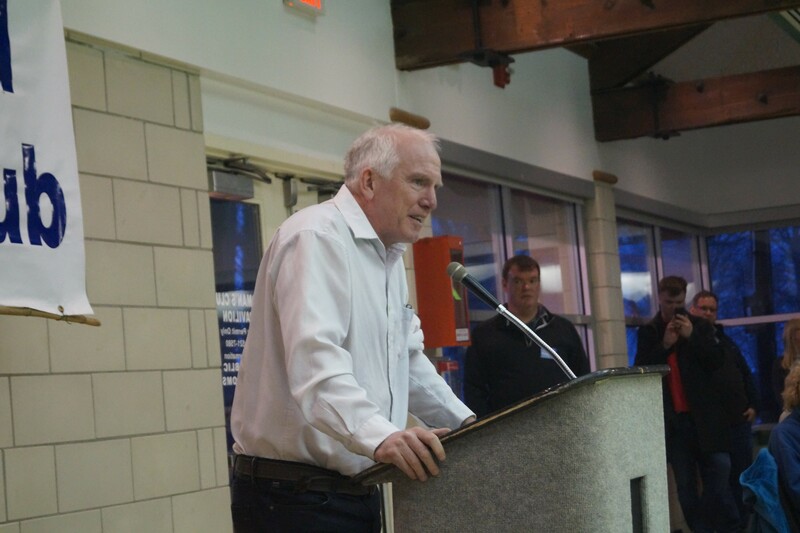 Marty Sweeney addresses the Lakewood Democratic Club, (3/29/2018). Recently submitted state campaign finance filings reveal that Marty Sweeney, a candidate for Ohio Senate District 23, made several payments for "consulting" in 2017 and 2018 to people who have never consulted before. While some of the payments were poorly labeled — "consulting" being broadly defined — others raise questions about what services the so-called consultants provided. Sweeney served as Cleveland City Council President from 2006-2013. He now serves as a state rep in Ohio House District 14, but is not seeking re-election in order to make way for his daughter, Bride Rose Sweeney. Instead, he is seeking the Ohio Senate seat in District 23, which includes much of Cleveland's west side, Lakewood, Brook Park and Parma. He is running against Nickie Antonio, who is also vacating a state rep seat due to term limits. On the heels of the #MeToo movement, Sweeney's campaign has been marred by his prior sexual misconduct. Earlier this week, many District 23 voters received a letter from the Cuyahoga County Democratic Party, written by that body's Jimmy Dimora-era Executive Director, Mary Devring. "Good Democrats of the 23rd Senate District ..." the letter teased, "Don't be fooled." 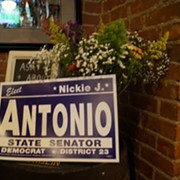 In her message to voters, Devring expressed her "strong disapproval" of the "desperate antics" of Nickie Antonio, who Devring claimed was erroneously calling herself the endorsed Democrat in District 23. 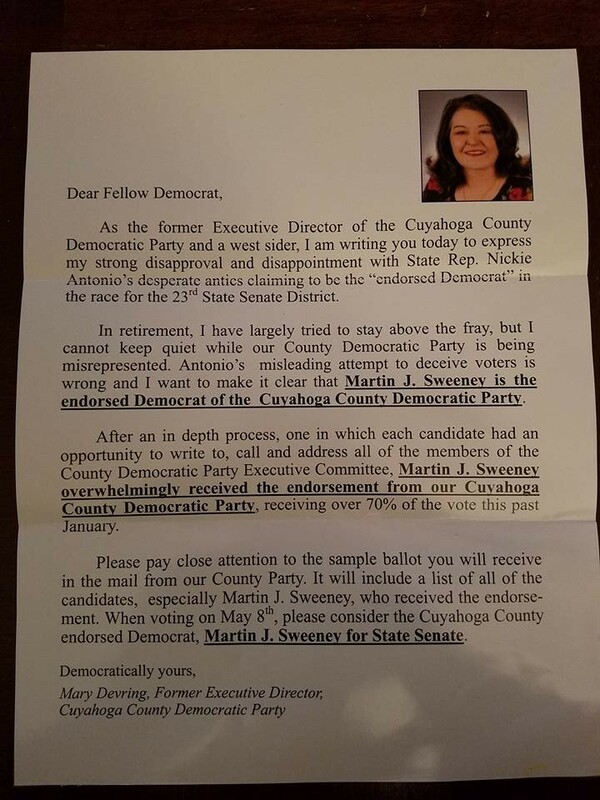 "I want to make it clear that Martin J. Sweeney is the endorsed Democrat of the Cuyahoga County Democratic Party," Devring wrote. And later: "Martin J. Sweeney overwhelming received the endorsement from our Cuyahoga County Democratic Party, receiving over 70% of the vote this past January." On social media, Antonio called the letter a "smear." And in a conversation with Scene, she said that while she frequently cited her many endorsements, she had never once claimed to be the endorsed candidate of the county party. "It's not on any of my literature," Antonio said. "I mean, does anybody in Cuyahoga County not know that Marty Sweeney received the endorsement?" Sweeney's party endorsement was pivotal, in large part, as Cleveland.com's Mark Naymik wrote in January, because the endorsed candidate benefits from the party's extensive get-out-the-vote efforts. The vote by the Cuyahoga County Democratic party's executive committee was held at Euclid High School on Saturday, January 19, the same day as the Women's March. As speakers on Public Square declared that only with new, committed political leaders (both locally and nationally) would the culture of sexual impropriety change, the county Democrats, in Euclid, aligned themselves with the city and ward leaders who'd recommended Sweeney by a razor-thin margin in a vote the previous weekend. Rick Nagin cast the deciding vote in the city and ward leaders endorsement. He is the City of Cleveland's Ward Leader in Ward 14 (Clark-Fulton, Brooklyn-Centre). He is a former city council candidate himself, a member of the Communist Party, and long an ardent opponent of former councilman Brian Cummins. Nagin was one of the key figures in Councilwoman Jasmin Santana's ground game in 2017, even helping to prop up a dummy candidate, Kyle Cassidy, the nephew of Ward 16 Councilman (and former Cummins challenger) Brian Kazy, with the intent to spoil votes for Cummins. Nagin received a $500 payment from Martin Sweeney on December 7, 2017, a month before the vote by city and ward leaders. The listed purpose of the payment, per Sweeney's 2017 annual filing, was "consulting." Nagin is not a consultant, though he has worked as an organizer for decades. Nagin had been a Nickie Antonio supporter, and the speculation by some in Ward 14, who were shocked by Nagin's shifting allegiance, was that Sweeney bought his vote. Scene had been told, in January, that Nagin received a payment from Sweeney to help with the publication of a book he was writing (a tract on scientific socialism), but we could not confirm the payment until the campaign finance filing. Scene sent Nagin questions about the payment via email. Was the $500 indeed to help with the publication of the book? Had there been any additional consulting work performed? When we reached Nagin by phone, he said he had no comment on our questions, and hung up. Antonio told Scene that Nagin's decision to support Sweeney in the city and ward leaders vote was a "big surprise" to her at the time. "Rick said, 'I'm gonna get you in the second round,'" Antonio said. "'I'm gonna vote for Marty in the city leaders meeting because I told him I would, but when it comes to the [executive committee] vote, I'll support you.' And I said, 'Rick, that makes no sense.' You're telling me Marty Sweeney shares your values? People were shocked." Tom Mastroianni is the treasurer for the city of Parma. He received $5,000 from Sweeney's campaign on November 12, 2017. Like Nagin's payment, the listed purpose for Mastroianni's was "consulting." Mastroianni is a member of the Parma Democratic club — he was dubbed a "mover and shaker" by one opponent — and received his consulting payment approximately one month before the endorsement vote by that body. The Parma Democratic Club voted overwhelmingly to endorse Sweeney. By email, Mastroianni denied that the payment had anything to do with the Parma Democratic Club endorsement. "Apart from my elected position," Mastroianni said, "I have done consulting for political candidates and have set up a company, Mastroianni Consulting, for candidates including Mr. Sweeney. Some of the things I do is help on literature, scheduling and targeting of mailers, advising during the campaign, among other areas of the campaign." In a follow-up, Mastroianni said that his consulting company had been registered as an LLC in March, 2015 (which is true), and repeated that he had advised candidates other than Sweeney, though did not name them. There is no record of Mastroianni ever receiving payments for "consulting" from any other Ohio state representative or senate candidate. He did not respond to a follow-up email asking how he would respond to Sweeney opponents who regard the payment as improper or suspicious. Bill Ritter is not a consultant. Nevertheless, he was another recipient of Sweeney's "consulting" payments. Ritter received $5,000 from Sweeney's campaign on February 19, 2018. The payment arrived less than a month after Ritter had designated a treasurer for a presumed political run. Ritter intended to run as a state rep in House District 14, where Sweeney's daughter Bride Rose is running. After the payment, Ritter abandoned his campaign. Reached by phone, Ritter flatly denied that he was bought out of the race. He said the $5,000 was for "knocking on doors" and "general fieldwork." "I have done this for 40 years as a volunteer," Ritter said, "And I'm through with not getting paid. I deserve to be paid." Ritter described Marty Sweeney as having been an "outstanding councilman" and said that he wasn't bothered by his past misconduct. "Unfortunately, in today's world, everybody's got something in their past. I'm more concerned about job performance moving forward." Ritter said that he had pulled petitions and was indeed considering a run for state rep this year, but after surveying the competition, he determined that it wasn't a race he could win. "The idea that I was paid to drop out, that's absolutely untrue," he said. "If Sweeney wanted to pay me to drop out, why wouldn't he have paid me when I ran against Kazy? 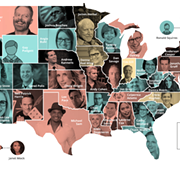 If I was inclined to take $5,000 to get out of the race, that would be the one to buy me out of. But $5,000's not a whole lot of money, politically speaking. People can say what they want to, but $5,000's not enough to make me drop out of a race I couldn't win." Ritter said that he was now also assisting with Bride Rose Sweeney's campaign — he believes that she is the best candidate in her race as well — serving as a "knocking-on-doors" guy. He said, looking at the landscape now, he believes that he might have done Bride Sweeney a favor if he'd stayed in the race. "If you look at the dynamics, it's three men [Rick Raley, Steve Holecko and Carl Burgio] and one woman," Ritter said. "I'd be the fourth. I'd probably split votes among the men." "Consulting" appears to be something of a catch-all in Martin Sweeney's campaign finance reports. At any rate, the term is used broadly and often. On July 12, 2017, Sweeney paid $500 to Joe Hollabaugh, the president of the American Professional Towers Association, for "consulting." On August 17, he paid a man named Bill Massina $250 for "consulting." On September 1, he paid $250 to a man named Jason Beudert. The listed purpose: "gift for consultant." Beudert, who briefly served as Scene's dining editor, said the gift was a wedding present. He said he had "advised [Sweeney] on social media on many occasions." "Consulting" also seems to encompass field operations on Sweeney's finance reports. In 2018, he paid $5,000 to Ryan Puente and $500 to former city councilman (and Sweeney flunky) Eugene Miller. Reached by phone, Puente, the president of the the Cuyahoga County Young Democrats, described his work as "field operations in Lakewood and Ward 11." Puente also manages the campaigns of both Rick Raley, who's running against Bride Rose Sweeney, and Tom Bullock, who's running against Mike Skindell in House District 13. (Skindell is vacating his seat in the Ohio Senate, District 23, due to term limits). Puente said his work with multiple campaigns was "pretty standard" in the local political scene. Responding via text message, Eugene Miller described his "consulting" work as conducting "in-house surveys," in the 23rd District. Elaborating, he said that his work included "data, auto calls and door-to-door management." Like Bill Ritter, Eugene Miller appears to be primarily a canvasser. Martin Sweeney did not respond to multiple requests for comment. He was made aware of our publication time by text message and email — his cell phone's voice mailbox has not yet been set up — but we will update if he provides a statement.